Wishing all fathers a Happy Father’s Day as we celebrate Dads again today. My own Dad died 29 years ago, just four months after my husband and I became parents. One of my most poignant photos is one of my Dad holding my son. Dad’s eyes are closed as if he is praying or quietly giving thanks for his seventh grandchild. I’d post the photo here except that it’s not the best picture of my little lad, who is looking just a teeny bit anxious at being somewhere other than in his mum’s or dad’s arms. It is sad that Dad died before my little boy could have come to feel more at ease in his grandfather’s loving arms … as I always did in my Dad’s. How blessed I was to have a Dad in whose arms I felt safe and cherished and loved! My heart goes out to all the girls and women whose experience of ‘father’ has been something quite different. I’ve just read on-line about a fellow poet’s abuse by her father. It made me cry. The legacy such an experience leaves can cast a long shadow over a person’s life, as I know from an abusive relationship I found myself in in my teens. On the one hand, I don’t want to rake that up here in a post to celebrate the wholesome, even holy, legacy that having a good father gives those who are blessed to experience one. But neither will I fail to ‘weep with those who weep’ among my friends and acquaintances who have suffered abuse. Several high profile cases in the news of late have stirred up many hurtful memories for me because of an unwise relationship I submitted to as a teenager. The flashbacks are filmic, and each mental ‘scene’ is felt as a shame-filled stab to my guts. Yes, the experience is that graphic and that painful. But those episodes occupied just two teenage years of unwise choices that I myself made. How much more painful must such memories be for girls and women whose childhoods and formative years were marred by cruelty or invasion by their own parent, whom they should have been able to have trusted and looked to for protection, comfort and care … for pure and wholesome love. I genuinely do shed tears of compassion for my sisters who have suffered this way. Sisters, may we all find healing and wholeness through the selfless love of a Good Man. I thank God that I had a Good Dad, and that my husband is a Good Dad. And I trust that the healing of damaged emotions and painful memories can be experienced, even after what is – for me – half a century of lugging the burden of abuse at the hands of another around with me. I know that such healing must come through forgiving the perpetrator. Forgiving is so hard to do, but so often abusers are themselves victims of defective parenting, or have suffered wickedness at the hands of others. And accepting that fact can help us to forgive … as we catch a glimpse of fellow-suffering in the face of our recalled abuser. So often they were as much ‘sinned against’ as ‘sinning’. Yes, forgiving is difficult, but I guess it begins with a willingness to forgive. Thank you, Father, for this revelation. I choose to be healed. It’s been a little quiet around here since Good Dadhood closed for submissions in June but that doesn’t mean nothing is happening behind the scenes! I’m hoping to be able to share some more news about the future of the project before too long. 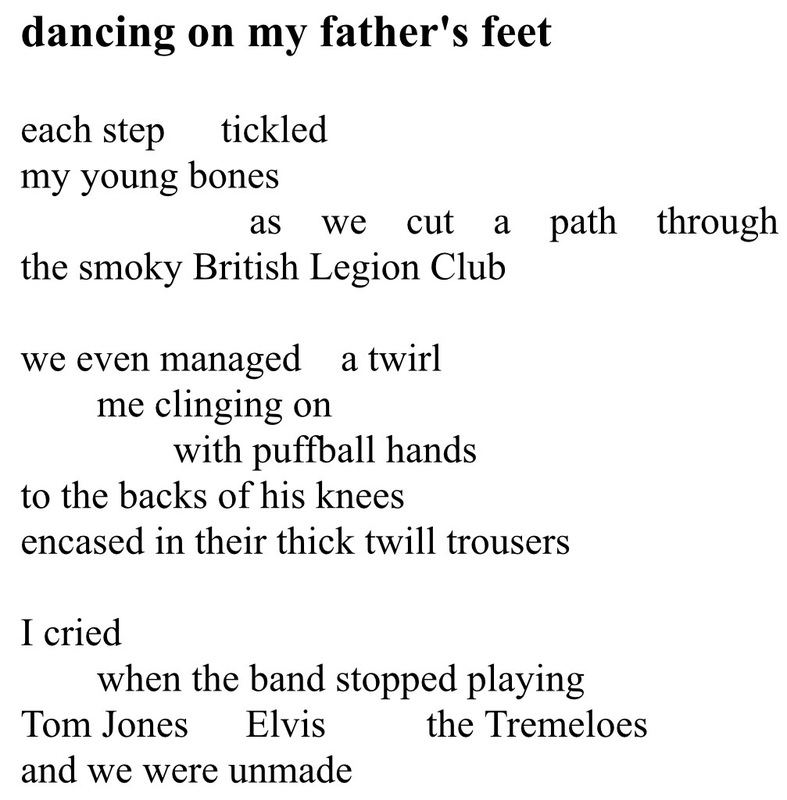 Meanwhile, one or two poems have hit my radar since June that I think are splendid Good Dadhood poems, and which deserve a wider audience, so with the poets’ permission, I’ll be adding them to a new page called More Good Dads. The first such poem – the lovely ‘To Lauren’ by Gill Wyatt – can be found on the new page: Poem by Gill Wyatt Check back for further additions … and for that news! There has been a Good Dadhood display in Cheltenham Children’s Library since Friday 16 June – ahead of Father’s Day on 18 June. Nurture by Stephen Daniels was previously published in Eunoia Review. and also to Jan (above) in the Children’s Library for her warm welcome when I turned up this morning with my camera! She enthused that it was great to have such positive poems in the Children’s Library, in celebration of Father’s Day. The Good Dadhood project (2017) reaches its conclusion today, Sunday 18 June – Father’s Day – with a fine body of poems in honour of Fatherhood … by a fine body of poets. • I’ve loved Good Dadhood … both being involved and reading the many and varied contributions. • … lovely project …. So refreshing to read celebrations of fathers and snapshots of their positive influences . An antidote to darker works where the focus is on blame and hurt. • Thank you … for giving voice to love. • … thank you for Good Dadhood … It’s been excellent! Meanwhile if a publisher out there would like to consider publishing the poems as an anthology, perhaps linked to a family-centred charity, please do get in touch. Or if a fellow poet with publishing experience would be willing to collaborate with me to publish a Good Dadhood Anthology 2017, please do get in touch. I’d welcome the ‘learning experience’ but it’s not a venture I’d want to tackle single-handed. Two parents would be great for this baby! Thank you again to all contributors and readers of Good Dadhood. yum-yummed over mud pie teas. to buttress my shaky mettle. pass it back for you. Kathryn Alderman was an actor on TV, Radio, Stage and Voice-over before motherhood. She won Canon Poets’ ‘Sonnet or Not’ (2012), came runner-up in Gloucestershire Writers’ Network Competitions (2012) and now co-directs the GWN competition. Publication includes Amaryllis, Canon’s Mouth, Dear World (Frosted Fire Press, 2014), Salt on the Wind (Elephants Footprint 2015), Last Word in Art (Wilson Art Gallery/Museum 2017). Readings include: BBC Radio 4; Cheltenham Literary and Poetry Festivals; Poetry Can Bristol, Cheltenham’s Buzzwords Poetry Café; Poetry Café Refreshed and with Cheltenham Poetry Festival’s ‘Festival Players’. Kathryn and family are herded around Gloucester by enthusiastic Border collie, Isla.